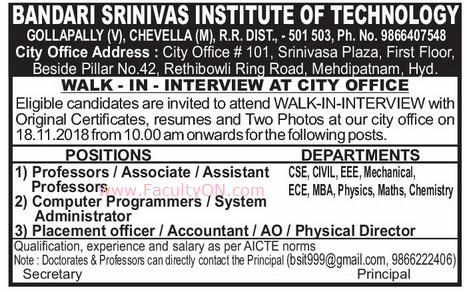 Bandari Srinivas Institute of Technology, Hyderabad has advertised in the EENADU newspaper for the recruitment of Teaching Faculty- Professor / Associate Professor / Assistant Professor Plus Non-Faculty jobs vacancies. Interested and eligible job aspirants are requested to walk-in on 18th November 2018. Check out further more details below. About College: Bandari Srinivas Institute of Technology (BSIT) is established during 2003-2004 which is approved by A. I. C.T. E, New Delhi and affiliated to J.N.T.U, Hyderabad and recognized by the Govt of Andhra Pradesh. The Principal and the Advisory Council Members are the engineers and Academicians associated with the J.NT University right from the starting year (1972) of the University. They form the best team to guide the destiny of BSIT to stand up as one of the best Institutes.